Artist: Use this parameter if you want to make sure you get results that include only songs by a particular artist. When you type Queen into the Search text box on its own, you get songs by the band Queen, but also “Dancing Queen” by ABBA. Track: Ensures you’re searching only for songs with that word (or those words) in the title. Feeling on edge? Type track:paranoid to uncover a lot of tracks that have paranoid in the title. The most popular result, Black Sabbath’s “Paranoid,” is listed first. You also see “Paranoid Android” by Radiohead, “Paranoid” by the Jonas Brothers, and farther down the list, “I Think I’m Paranoid” by Garbage. Year: Just type year:1997 to find all songs from that year, with the most popular listed first. You can also search a range of years. For a soundtrack that defines university life, for example, you could type year:1995-1997 and be taken back to a time when Prodigy and Smashing Pumpkins ruled the airwaves (alongside the Spice Girls and Backstreet Boys). Record label: Spotify isn’t all about the big four record labels. There are countless smaller, independent labels in its library. Remember, if a label consists of more than one word, you can put it in quotes. So, to search for artists signed to Domino Records, search for label:“Domino Records”. Sometimes, however, you get more results if you search for only the first word in the label’s name — a search for XL Recordings doesn’t give you nearly as many results as a search for just XL, so a little trial and error may be necessary here. Above the main list of search results, you can actually click through to the most popular related artists and albums of the moment. 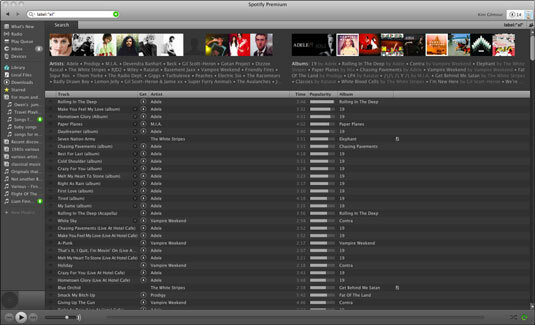 When typing a plain text query into the search box (without any special parameters), Spotify now presents results in ‘real time’ in a drop-down list. These are conveniently categorized into tracks, playlists, artists, and albums. You may see your desired result straight away before you’ve even finished typing your query. If not, narrow down your search using the parameters above and hit the Enter key to view more targeted results. Album: Type in album:Grace to bring up Jeff Buckley’s classic, as well as other albums containing the word grace. Enter the name in quotes if it consists of more than one word, such as album:“Teenage Dream”. New tracks: Spotify is always adding new tracks to its database — thousands per day. Use the parameter tag:new to view the most-recently added albums (listed at the top of a page of blank search results). This isn’t an exhaustive list — Spotify adds thousands of tracks every day that aren’t listed in this category. International Standard Recording Code (ISRC): The ISRC is the musical equivalent of the ISBN number on the back of books — a unique code that identifies a piece of media. The everyday Spotify user isn’t going to look up a track by its ISRC code because she doesn’t know what it is. Codes apply to all tracks, not just albums, and are mainly used as a way to easily monitor and distribute royalty payments. If you do happen to know the ISRC of a track, type isrc: followed by the code — so isrc:GBCVT0100005 brings up the track “Bliss,” by Muse. Universal Product Code (UPC): The barcode you usually find at the back of a CD. Type in upc: followed by the numbers under the barcode to bring up the album, if Spotify has it in the database.